San Jamar C3400P Pull Type Cup Dispenser 12 oz. - 24 oz. 12 oz. - 24 oz. 6 oz. - 10 oz. 32 oz. - 46 oz. Keep your soda fountain or slushy machine area clean and organized with this San Jamar C3400P pull type cup dispenser. The stainless steel, self-adjusting plastic cup dispenser securely holds cups ranging in size from 12 oz. to 24 oz. The top loading San Jamar C3400P pull type cup dispenser easily attaches to soda machines or any flat surface with its included mounting bracket. San Jamar C3500P Pull Type Cup Dispenser 32 oz. - 46 oz. San Jamar C3200P Pull Type Cup Dispenser 6 oz. - 10 oz. San Jamar C4150SS Pull Type Cup Dispenser 3 oz. - 5 oz. Overall User Rating: San Jamar C3400P Pull Type Cup Dispenser 12 oz. - 24 oz. We bought this cup dispenser to dispense water cups instead of trying to juggle them around in original packaging. It was a huge help, it makes the process of giving customers a clean sanitized cup so much easier! We use these cup holders to have our cups out of the way, but still very accessible for our cashiers. Less clutter, more efficient team members. Easy to use and easy to install. We use these very frequently and they've held up to our high volume. We now have 4 of these and they are great! We needed a quick way to dispense cups at our bakery and we were very lucky to come find this! It is very sturdy, easy to use, and sanitary as it keeps cups off the counter. We have four at our store! During the cold months we add hot beverages to our food truck and this dispenser is perfect for mounting by our service window. Love the ability to adjust the cup size that goes into the dispenser. This stainless steel cup dispenser is a great way to organize your cups and keep them off of your counter. Mounts easily to any wall and dispenses cups one at a time. Prior to purchasing this product we had cups that were sitting on the counter top and would some time get knocked off onto the floor requiring us to have to discard them. This dispenser puts them out of the way in a convenient location. Great cup dispenser! It does not jam, and it is very easy to clean. It is very solidly built and would buy again if need be. This cup dispenser keeps your cups organized and ready to dispense when needed. Nice stainless finish looks great and is perfect for any restaurant or café. We use a 16oz. foam cup for our take out beverages and staff drinks and this holder and dispenser works excellent. Cups do not fallout without someone pulling and it keeps the beverage station organized. These cup dispensers from San Jamar are a nice way to keep your cups organized and clean. Available in various sizes to match your cups, these are also adjustable. Stainless steel construction looks nice and is sturdy. These cups worked great for our drive through location. Gravity worked a bit better than the spring ones we had in our main location and the cups dispensed well one at a time. I was not very pleased with this product. 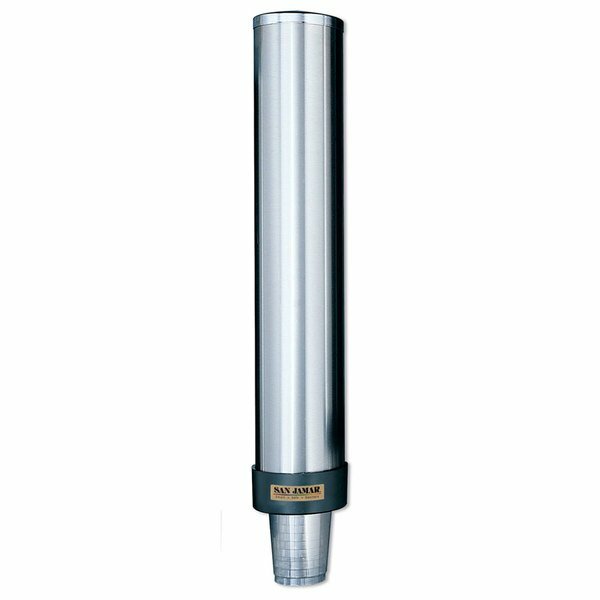 It is made from very thin stainless steel which can be bent and dented extremely easily. The wall mount does not hold very well either so this product can sometimes slip off of the wall. On the plus side it is very east to adjust the size to hold several different sizes of cups. Overall I would suggest that buyers be mindful of their work environment because heavy traffic areas may not be the best for this product. This product holds our 6, 8, and 12 oz ice cream cups. The dimensions matched what could fit so I used them for that. They are functional and cost effective. I bought 4 of them for my different sized cups (12oz & 20oz) and they are adjustable so they work great with both sizes, (paper and plastic) I have since bought another one for a different location! we operate a coofee/sandwich shop I mounted three of these next to our drink equiptment ,they have been in service for three months .no problems..
we used to just keep the case of cups on a shelf near the soda machine. installed this pull type dispenser, and wow the space we saved. great product. I love these cup dispensers. We have 4 of them hanging in our concession trailer. They are so convenient to keep everything in order and come with the hanging hardware. Very attractive too. I proudly own 13 of these dispensers. I use them to dispense styrofoam cups for our shaved ice business. They are easy to adjust according to your cup size and I do not have any problems with the cups free-falling out of the dispenser. Cups stay snug, yet are easy to dispense. These dispensers look good,, these will be much better than having the cups setting on counter top.. We will be able to adjust to size cup used for ice cream an soda usage. This is a great product to have in the office, restaurant and in the home. It has different settings for various size cups. we bought an extra for the house since we entertain alot.